Get in touch with nature at Laurance Rockefeller Preserve and Grand Teton. 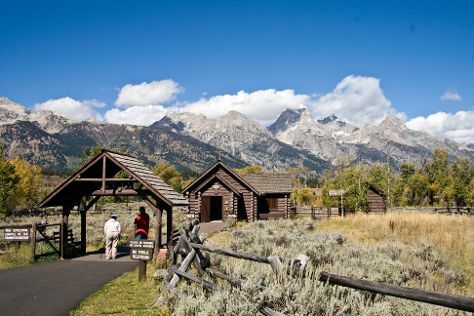 Explore hidden gems such as Teton Raptor Center and Blacktail Ponds Overlook. There's still lots to do: stroll through Cascade Canyon Trail and make a trip to Town Square. To find traveler tips, maps, where to stay, and other tourist information, you can read our Jackson Hole day trip planner . Kalamazoo to Jackson Hole is an approximately 7-hour flight. You can also drive. The time zone difference when traveling from Kalamazoo to Jackson Hole is minus 2 hours. Plan for slightly colder nights when traveling from Kalamazoo in July since evenings lows in Jackson Hole dip to 44°F. Finish your sightseeing early on the 3rd (Wed) to allow enough time to drive to West Yellowstone. Kick off your visit on the 4th (Thu): take a tour by water with Boat Tours & Water Sports, get to know the fascinating history of Yellowstone Historic Center, and then look for all kinds of wild species at Grizzly and Wolf Discovery Center. To find reviews, where to stay, and tourist information, go to the West Yellowstone planner . Traveling by car from Jackson Hole to West Yellowstone takes 3 hours. Alternatively, you can do a combination of bus and car; or do a combination of bus and shuttle. Traveling from Jackson Hole in July, West Yellowstone is slightly colder at night with lows of 39°F. 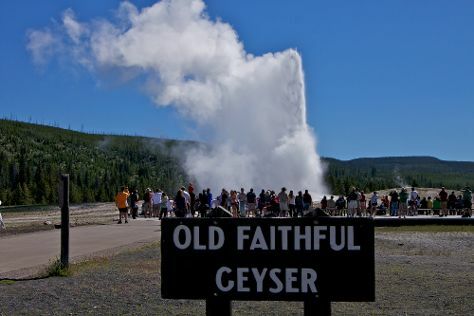 Wrap up your sightseeing on the 4th (Thu) early enough to drive to Yellowstone National Park. Step off the beaten path and head to Firehole Canyon Drive and Artist Point. Get in touch with nature at Midway Geyser Basin and Upper Geyser Basin. There's still lots to do: explore the activities along Yellowstone Lake, take in breathtaking views at Grand Canyon of the Yellowstone, take in the natural beauty of Lone Star Geyser, and explore the striking landscape of Lake Butte Overlook. For reviews, ratings, more things to do, and tourist information, refer to the Yellowstone National Park trip itinerary app . Traveling by car from West Yellowstone to Yellowstone National Park takes 1.5 hours. Alternatively, you can take a bus. In July, daytime highs in Yellowstone National Park are 73°F, while nighttime lows are 39°F. Finish your sightseeing early on the 8th (Mon) to allow enough time to travel to Moab. Escape the urban bustle at Double Arch and River Rafting & Tubing. Step off the beaten path and head to Windows and Double Arch. Take a break from Moab with a short trip to Delicate Arch in Arches National Park, about 38 minutes away. Make the 11th (Thu) an unforgettable day with an extreme tour. And it doesn't end there: skim along the rocks with a canyoning and rapelling tour, take in the dramatic natural features at Turret Arch, admire the majestic nature at Dead Horse Point State Park, and take your sightseeing to a higher altitude at Double Down Bike Shop. To find ratings, photos, and other tourist information, use the Moab trip planner . Getting from Yellowstone National Park to Moab by combination of car and flight takes about 8 hours. Other options: do a combination of car and flight; or drive. In July, Moab is much warmer than Yellowstone National Park - with highs of 97°F and lows of 67°F. Wrap up your sightseeing on the 12th (Fri) early enough to drive to Grand Canyon National Park. Visiting North Kaibab Trail and Mather Point will get you outdoors. You'll explore the less-touristy side of things at Rim Trail and South Kaibab Trail. On the 14th (Sun), hike the day away at Bright Angel Trail. Next up on the itinerary: take in breathtaking views at Grand Canyon South Rim and take some stellar pictures from Powell Point. For where to stay, reviews, photos, and other tourist information, you can read our Grand Canyon National Park trip planner . You can drive from Moab to Grand Canyon National Park in 5.5 hours. Traveling from Moab in July, things will get a bit cooler in Grand Canyon National Park: highs are around 84°F and lows about 52°F. Cap off your sightseeing on the 16th (Tue) early enough to go by car to Flagstaff. Kick off your visit on the 17th (Wed): take in breathtaking views at Walnut Canyon National Monument, then explore the fascinating underground world of Lava River Cave, and then explore the fascinating landscape at Painted Desert. To find traveler tips, more things to do, other places to visit, and other tourist information, you can read our Flagstaff day trip planner. You can drive from Grand Canyon National Park to Flagstaff in 1.5 hours. Expect a daytime high around 81°F in July, and nighttime lows around 52°F. Finish up your sightseeing early on the 17th (Wed) so you can travel to Carmel. Carmel-by-the-Sea, often simply called Carmel, is a city in Monterey County, California, United States, founded in 1902 and incorporated on October 31, 1916. You'll enjoy a bit of beach vacationing at Julia Pfeiffer Burns State Park and Pacific Grove Shoreline Parkway Marine Refuge. Step out of the city life by going to Point Lobos and Carmel River State Beach. Step out of Carmel with an excursion to McWay Falls in Big Sur--about 56 minutes away. Spend the 19th (Fri) observing fascinating marine mammals with a dolphin and whale watching tour. The adventure continues: explore the activities along Monterey Bay. To see photos, maps, other places to visit, and tourist information, read our Carmel online route maker . You can fly from Flagstaff to Carmel in 5 hours. Other options are to do a combination of bus and flight; or drive. You'll gain 1 hour traveling from Flagstaff to Carmel due to the time zone difference. Traveling from Flagstaff in July, you will find days in Carmel are slightly colder (69°F), and nights are about the same (55°F). Wrap up your sightseeing on the 20th (Sat) early enough to drive to Yosemite National Park. Get in touch with nature at Tuolumne Meadows and Sentinel Dome. 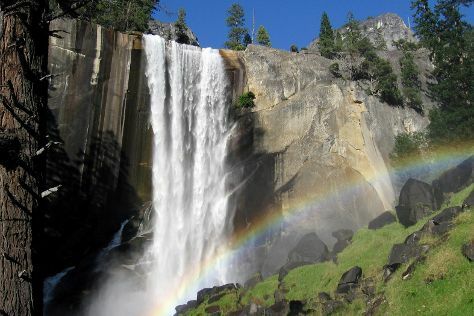 Discover out-of-the-way places like Vernal Fall and Mariposa Grove of Giant Sequoias. Spend the 23rd (Tue) exploring nature at Bridalveil Fall. There's much more to do: take in the dramatic natural features at Glacier Point, trek along Panorama Trail, make a trip to Olmsted Point, and admire the sheer force of Yosemite Falls. To find where to stay, more things to do, reviews, and other tourist information, refer to the Yosemite National Park trip planner . Traveling by car from Carmel to Yosemite National Park takes 5 hours. Alternatively, you can do a combination of flight and car; or do a combination of shuttle, flight, and car. When traveling from Carmel in July, plan for a bit warmer days in Yosemite National Park, with highs around 83°F, while nights are little chillier with lows around 46°F. Finish up your sightseeing early on the 24th (Wed) so you can travel to Newport. You'll enjoy a bit of beach vacationing at Gleneden Beach State Park and Fogarty Creek State Recreation Area. You'll explore the less-touristy side of things at Dolphin & Whale Watching and Yaquina Bay State Recreation Area. Change things up with these side-trips from Newport: Hobbit Trail (in Florence) and Yachats (Cape Perpetua Visitor Center - Siuslaw National Forest & Smelt Sands State Park). There's more to do: look for all kinds of wild species at Yaquina Head Outstanding Natural Area and grab your bike and head to Mike Miller Park. To see reviews, maps, ratings, and more tourist information, you can read our Newport day trip planning site . You can do a combination of taxi, bus, and flight from Yosemite National Park to Newport in 15 hours. Another option is to do a combination of taxi, bus, and train. When traveling from Yosemite National Park in July, plan for cooler days and about the same nights in Newport: temperatures range from 63°F by day to 50°F at night. Finish your sightseeing early on the 27th (Sat) to allow enough time to drive to Cannon Beach. Cannon Beach is a city in Clatsop County, Oregon, United States. You'll enjoy a bit of beach vacationing at Manzanita Beach and Rockaway Beach Wayside. Step off the beaten path and head to Ecola State Park and Hug Point State Recreation Site. Next up on the itinerary: admire the majestic nature at Hug Point State Park, stroll through Cannon Beach, kick back and relax at Haystack Rock, and brush up on your knowledge of spirits at Cannon Beach Distillery. For traveler tips, where to stay, photos, and tourist information, read Cannon Beach day trip planning site . Traveling by car from Newport to Cannon Beach takes 3 hours. Alternatively, you can take a bus. When traveling from Newport in July, plan for a bit warmer days and about the same nights in Cannon Beach: temperatures range from 69°F by day to 55°F at night. Finish your sightseeing early on the 30th (Tue) to allow enough time to travel back home.